I haunt used bookstores. Digging through the stacks to find just the right title for the mood or occasion gives me a thrill. The discard pile at the library this week led me to a winner, for just a dollar, too. When I last left you, the boy had announced he would not be going on our family RTW trip. He’s back on board now, and I have a new favorite book. 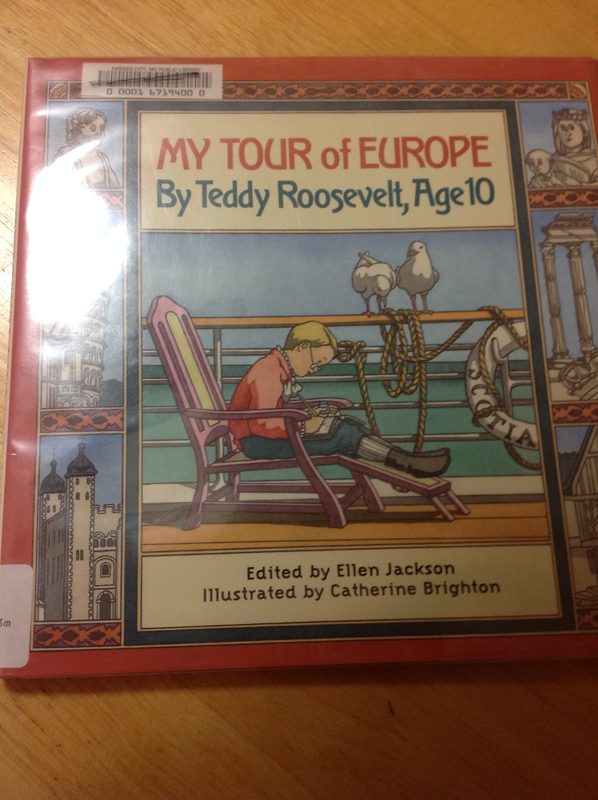 I found a children’s picture book in the library discard sale, “My Tour of Europe By Teddy Roosevelt, Age 10” edited by Ellen Jackson. At age 10, Teddy Roosevelt’s family went on a year long trip to Europe, and he had to keep a journal while they traveled! A year long family trip? Writing a journal as part of your schoolwork? My boy was most intrigued that another boy had done this, that he got to play and have fun, and that he was naughty on the trip. It was even a boy who got to be president when he grew up. “I guess I can go, then,” he told me, after he finished the book. Score! Now about that ice fishing, son. This entry was posted in Planning, Roadschooling. Bookmark the permalink. Stephanie, this was such fun to read! I sense a book is in the making, good luck!